Forgiveness - Portrait Challenge Blog - 3rd Painting Completed! This is amazing. Especially when you consider the quality of the old source photo. I like your style, @Forgiveness. Thanks all! @Kingston I will try that!, neutral green and neutral violet, it's about representing a boulder (out of focus) in my background which I am leaning against, right arm outstretched, on a beach, sunset (Monterey, CA). @movealonghome paint was drying so fast on the canvas as is and simply painted over it, works real well as underpainting in this case. The more I looked, the more I saw and learned about the colors from this photo. @tassieguy and such a tiny photo to begin with, enlarged to lifesize! Given that I can draw this helps a great deal in oil painting! Great work!!! I have so appreciated that you have included us in your journey. 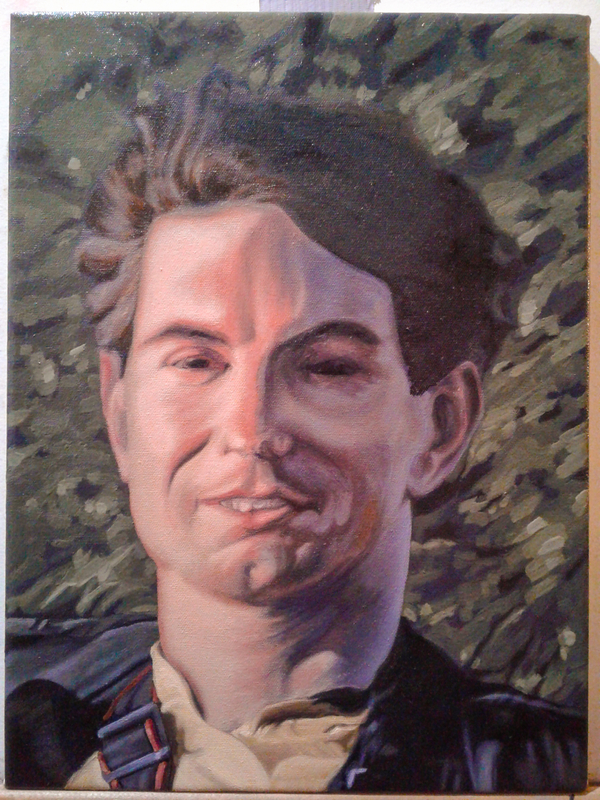 The only suggestion I have is to obscure/remove the consistency of tone and brush work along the left side nearest the face -- the background will look more like background if it is more random. Hope this is helpful. This is my idea of muted green and violet for this background, brought out warmer colors in the skin tones. I believe this to be complete. Any further suggestions, comments? It's been a fantastic experience doing this, after having learned so many new things about portrait painting in oil. Thanks to everyone! I will try this on linen and dybond in the future. Just had to sign it, and nicer photo. Thanks again everyone! Nice to see if finished @Forgiveness. You did a great job. Great work @Forgiveness, your perseverance paid off. The photo reference for this portrait was taken right after celebrating Thanksgiving in US, San Francisco, 1984 and had the time of my life! Happy Thanksgiving once again! Finally it is done! It should have there on the challenge page! The background has an airy movement which is amazing. Love this! Congratulations on completing this creative journey!! And thank you for including us along the way. That airy movement would also include just how windy it was on the beach at that time, a challenge to be still enough. Thanks @Bancroft414 and @Kautav, will include in the challenge, this is best. I'm considering softening some of the edges that I find too hard, need softening. Can I still do that at this point even though dry 3 weeks now, am I being nitpicky? should I just simply leave it. Looks like a cut out, pasted in place in some areas, also find these hard edges inconsistent and interferes with the overall integrity of the piece. Constructive feedback is helpful, thanks. paint another. maybe soften edges but I think they are ok with this background. paint another with an "In-Focus" background. I agree with 'paint another'. I don't think I've ever been fully satisfied with anything I've painted. But I recognize the feeling of 'done' and the value of continuing my education with the next painting. I think you've accomplished so much with this one! I hope you feel great about that! Thank you, I do feel quite good about it as is, it's a gift, I really appreciate all the fine support along the way! and onward.